1, base of bole; 2, part of flowering twig; 3, dehisced fruit. Afzelia, East African afzelia, mahogany bean, pod mahogany, Rhodesian mahogany (En). Afzelia quanzensis is widespread, occurring from southern DR Congo and Somalia south to Angola, Botswana, Zimbabwe, Mozambique and northern South Africa. Like other Afzelia spp., the wood of Afzelia quanzensis is characterized by an excellent stability with little susceptibility to variations in humidity, small shrinkage rates during drying and a good natural durability. The wood is durable and treatment with preservatives is unnecessary, even for usage in permanent humid conditions or in localities where wood-attacking insects are abundant. This makes it an excellent wood for use in pleasure-crafts, especially for keels, stems and panels, for bridges, as well as interior fittings. The wood is locally popular for musical instruments. It is also valued for joinery and panelling, both interior and exterior, parquet floors, doors, frames, stairs, vehicle bodies, furniture, sporting goods, toys, novelties, mine props, railway sleepers, agricultural implements, utensils, tool handles, draining boards, carving, turnery, fibre board and particle board. It is suitable for decorative sliced veneer. Because of its good resistance to many chemical products and great dimensional stability, it is often preferred to materials like metals and synthetics for vats and precision equipment in industrial applications. The neutral pH of the wood makes it suitable for applications in contact with vulnerable objects such as antiques and old books in libraries. However, it should not be used in contact with textiles under more humid conditions because of the presence of colorants. Dugout canoes have been made from the bole. The wood is also used as firewood and for charcoal production. Leaves are cooked together with potash and eaten in a mixture with other vegetables. The foliage is browsed by livestock, mainly towards the end of the dry season when little food is available. Fallen flowers are also eaten by livestock. Honey bees visit the flowers for nectar. The bark is used for making rope. The seeds are locally popular for necklaces and ornaments. Afzelia quanzensis is sometimes planted as an ornamental shade tree. Various plant parts are used in traditional medicine. Root decoctions or macerations are taken to treat schistosomiasis, stomach-ache, gonorrhoea and snake bites, and as aphrodisiac, whereas root pulp is applied externally to treat rheumatism. Bark decoctions are drunk against malaria, pneumonia, uterine complaints, threatened abortion and snake bites, and the bark is applied externally to treat skin complaints, toothache and gum bleeding. Leaf sap is taken against malaria and a leaf filtrate is dropped into the eyes to treat conjunctivitis. Roots are used as an ingredient in the preparation of dart poison. Magical properties are ascribed to the tree. Afzelia quanzensis timber is traded on the international timber market in small quantities only. However, in several countries it is recorded to be one of the most favoured timbers for the local markets, e.g. in Somalia, eastern Tanzania, Angola and particularly Mozambique (often called ‘chanfuta’). In 2004 Afzelia quanzensis was ranked third on the list of most important timbers of Mozambique, and provided nearly 20% of the total production. Until the first years of the 2000s, mainly logs have been exported from Mozambique, but from then export of the timber was only allowed in processed condition. The quality of sawn wood from Mozambique often does not comply to the international standards, and therefore it is mainly used domestically. In 2003 in Tanzania, about 400 m³ of Afzelia quanzensis timber was issued on harvest licences. In the East Usambara Mountains in Tanzania, the price of a plank of c. 3.7 m × 0.3 m was US$ 4.80 in 2001. The heartwood is yellowish brown to pinkish brown, becoming red-brown upon prolonged exposure, sometimes with darker streaks. It is distinctly demarcated from the whitish to pale yellow, up to 10 cm wide sapwood. The grain is straight to interlocked, texture coarse but even. The wood is rather heavy, with a density of 800–870(–920) kg/m³ at 12% moisture content. Drying usually does not cause problems, without deformation and splitting, but the wood dries rather slowly. For thick boards (more than 7.5 cm), preliminary air drying under cover is recommended before kiln drying. The shrinkage rates are low, from green to oven dry 2.8–3.8% radial and 4.0–5.5% tangential. Once dry, the wood is very stable in service. At 12% moisture content, the modulus of rupture is 83–135 N/mm², modulus of elasticity 8500–15,000 N/mm², compression parallel to grain 52–80 N/mm², compression perpendicular to grain 14 N/mm², shear 7–20 N/mm², cleavage 17–28 N/mm and Janka side hardness 6600–9850 N.
The wood saws easily when good equipment is used; it contains little silica (less than 0.015%) and stellite-tipped saw teeth are not needed for sawing fresh wood. Some logs have gum pockets, which may cause problems in sawing by blunting saw teeth. Tungsten-carbide-tipped cutting tools are recommended in planing and moulding operations. It is advisable to reduce the cutting angle to 15° to avoid rough surfaces when interlocked grain is present. The use of a filler is recommended to obtain smooth surfaces. The nailing and screwing properties are satisfactory, but pre-boring is recommended to avoid splitting. Gluing usually does not cause problems. The wood paints and varnishes well, but wood zones close to the centre of the log may contain anti-oxidant substances that slow down drying of varnish and may cause problems in painting. Sliced veneer of good quality can be produced, but the wood is not used for peeling. The results in turnery are excellent. The wood has a good reputation for its resistance to acids and alkalines. The heartwood is durable, with an excellent resistance to fungal, termite and borer attacks, and it has also been reported resistant to marine borers. The sapwood is susceptible to Lyctus attack. The heartwood is resistant to impregnation with preservatives. Saw dust may cause inflammation of the eyes. Logs may have crevices filled with a yellowish powdery substance originating from the wood vessels. The seed oil contains considerable amounts of crepenynic acid and dehydrocrepenynic acid. Crepenynic acid is a potential inhibitor of essential fatty acid metabolism, and proved toxic to sheep. Dehydrocrepenynic acid acts as inhibitor of conjugation in gram-negative bacteria, which may provide a means to control the spread of antibiotic resistance. Oleic acid and linoleic acid are also present in the oil. Aqueous bark extracts showed antifungal activity against Candida albicans. The roots have been associated with cases of fatal poisoning. The wood of other Afzelia species is similar to that of Afzelia quanzensis, Afzelia africana Sm. ex Pers. and Afzelia bella Harms, mainly exported from West Africa, and Afzelia bipindensis Harms and Afzelia pachyloba Harms, mainly exported from Central Africa. The excellent properties of Afzelia quanzensis wood concerning dimensional stability and high natural durability are comparable to some well-known timbers such as merbau (Intsia spp.) and teak (Tectona grandis L.f.), and to the African makore (Tieghemella heckelii (A.Chev.) Roberty) and douka (Tieghemella africana Pierre). In Zimbabwe the wood of Afzelia quanzensis is sometimes used in carving as alternative for Pterocarpus angolensis DC. Deciduous small to medium-sized tree up to 25(–35) m tall; bole branchless for up to 15 m, often short, straight or irregular, up to 100(–150) cm in diameter, usually without buttresses; bark surface greyish brown, slightly fissured and scaly, leaving paler patches with sinuous ridges; crown rounded or flattened, dense, with spreading, thick branches; twigs slightly hairy to glabrous. Leaves alternate, paripinnately compound with (2–)4–7(–10) pairs of leaflets; stipules with basal parts fused and persistent, upper parts free, linear and caducous; petiole and rachis together (7–)10–20(–30) cm long; petiolules 0.5–1 cm long, often slightly twisted; leaflets opposite, broadly ovate to oblong-elliptical, 3–9(–14) cm × 2–6 cm, rounded to notched at apex, glabrous, pinnately veined with c. 8 pairs of lateral veins. Inflorescence a terminal raceme or panicle up to 7.5(–10) cm long, short-hairy, few-flowered. Flowers bisexual, zygomorphic, sweet-scented; pedicel 0.5–1 cm long; bracteoles 0.5–1 cm × 0.5–1 cm, caducous; hypanthium 1–2 cm long; sepals 4, slightly unequal, 1.5–2.5 cm long, short-hairy outside; petal 1, 2–4 cm long, with long claw, 2-lobed, red or greenish with a red median line, sometimes 4 rudimentary petals present; fertile stamens 7(–9), and 3–4.5 cm long, rudimentary stamens 2, and c. 0.5 cm long; ovary superior, c. 0.5 cm long, with short stipe, slightly hairy, style c. 2.5 cm long. Fruit an oblong or obovate, flattened pod 10–20(–30) cm × 5–8 cm, dark brown, dehiscing with 2 woody valves, 5–13-seeded. Seeds ellipsoid, 2–3.5 cm long, black, with cup-shaped, orange to red aril covering the seed for c. 1/3. Seedling with epigeal germination; first 2 leaves opposite, with 4 pairs of leaflets. Vessels: 5: wood diffuse-porous; 13: simple perforation plates; 22: intervessel pits alternate; 23: shape of alternate pits polygonal; 26: intervessel pits medium (7–10 μm); 29: vestured pits; 30: vessel-ray pits with distinct borders; similar to intervessel pits in size and shape throughout the ray cell; 42: mean tangential diameter of vessel lumina 100–200 μm; 46: ≤ 5 vessels per square millimetre; 58: gums and other deposits in heartwood vessels. Axial parenchyma: 80: axial parenchyma aliform; 81: axial parenchyma lozenge-aliform; (82: axial parenchyma winged-aliform); 83: axial parenchyma confluent; 89: axial parenchyma in marginal or in seemingly marginal bands; 91: two cells per parenchyma strand; 92: four (3–4) cells per parenchyma strand. During the first years, growth of seedlings is fair, 50–60 cm in height per year. After about 7 years, young trees developed a distinct bole and a spreading crown. Diameter growth of the bole is slow, 0.5–3 mm/year. The tree is deciduous; young leaves are copper-coloured and glossy. In southern Africa trees flower in July–November, and in Kenya in March–April. In each inflorescence, only one flower is open at a time. The fragant flowers are visited by insects such as bees, which serve as pollinators. Fruits may take nearly one year to mature after flowering. Animals such as monkeys and hornbills feed on the arils and disperse the seeds. The roots are associated with ectomycorrhizal fungi. Afzelia quanzensis occurs in a wide variety of habitats, in dry evergreen forest, open woodland and scrub forest, up to 1350(–1800) m altitude. It prefers deep, well-drained, sandy soils, and is also found on termite mounds. It does not tolerate waterlogging. It is often associated with Brachystegia and Pterocarpus spp. Older trees are quite resistant to drought. Afzelia quanzensis is susceptible to fire because this hampers natural regeneration. Natural regeneration of Afzelia quanzensis is often poor. Seedlings are usually found close to parent trees, and in Mozambique and northern South Africa mortality of seedlings is reportedly high, more than 65%. However, in Zimbabwe 69% of planted seedlings were still alive after one year. Seedlings are susceptible to drought and browsing animals. Fruits can be collected when they have become dark brown. There are 250–500 seeds per kg. The germination rate of fresh seed is high, up to 90%, and germination starts 1.5–4 weeks after sowing. Seeds dried in the sun to a moisture content of 6–10% can be stored for long periods. They can be stored at 3°C in a dry locality for up to 10 years with still a germination rate of 30%. However, under natural conditions, the germination rate declines strongly after 3 months. Pre-treatment of the seeds is not necessary although scarification accelerates germination. It is recommended to remove the aril, and to sow the seeds in a 5:1 mixture of river sand and compost. The seedlings need regular watering and should be protected from frost for the first two years. Seedlings raised in the nursery can be transplanted after 4–6 months. Wildlings are sometimes collected for planting. An experiment in Mozambique with semi-hardwood cuttings treated with indole butyric acid gave 60% of successful rooting. Older trees usually occur scattered, rarely in small groups. Trees can be managed by lopping and pollarding. In Tanzania the longhorn beetle Pachydissus hector may attack the boles of standing trees; it may cause serious damage to sapwood, but sometimes also to heartwood. In Kenya baboons and squirrels consume high percentages of immature seeds after opening the woody fruits with their teeth. Ripe seeds are susceptible to insect attacks. The minimum bole diameter for harvesting in Tanzania is 55 cm. Prolonged stocking of logs after harvesting does not cause problems except occasional black holes in the sapwood caused by borer attacks. Logs of Afzelia quanzensis are too heavy to be transported by river. Although Afzelia quanzensis is widespread, it is locally threatened by exploitation for its valuable timber, e.g. in Tanzania and Zimbabwe. In many areas, the minimum bole diameter for harvesting is not respected and larger trees have become rare. An inventory in eastern Tanzania in 2005 showed that nearly all Afzelia quanzensis trees cut for timber were below the minimum diameter limit allowed for harvesting. A provenance collection has been carried out in Malawi in 1995, resulting in 29 accessions from 4 provenances. The low growth rate of Afzelia quanzensis limits its prospects as a commercial plantation timber tree. However, the high value of its wood makes it economically interesting and warrants research on its genetic diversity and breeding for superior characteristics, also to take the pressure from wild populations. Pharmacological studies are needed to support the uses in traditional medicine. The tree has ornamental value. 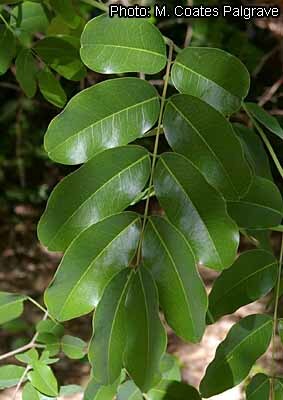 As a true multipurpose tree, Afzelia quanzensis should be considered for application in agroforestry systems. Orwa, C., Mutua, A., Kindt, R., Jamnadass, R. & Simons, A., 2009. Agroforestree database: a tree reference and selection guide. Version 4.0. [Internet] World Agroforestry Centre (ICRAF), Nairobi, Kenya. http://www.worldagroforestry.org/ resources/databases/ agroforestree. February 2011. CAB International, 2005. Forestry Compendium. Afzelia quanzensis. [Internet] http://www.cabicompendium.org/ fc/datasheet.asp?CCODE=AFZ_QU. February 2011. Gathua, M., 2000. The effects of primates and squirrels on seed survival of a canopy tree, Afzelia quanzensis, in Arabuko-Sokoke Forest, Kenya. Biotropica 32(1): 127–132. Salência, H.R., 2005. Indução da radiciação e avaliação do potencial de propagação vegetative em estacas semi-lenhosas de Litchi chinensis (Litchi) e Afzelia quanzensis (Chanfuta). Bachelor Thesis, Department of Biology Science, Faculty of Science, UEM, Maputo, Mozambique. 50 pp. Steenkamp, V., Fernandes, A.C. & van Rensburg, C.E.J., 2007. Screening of Venda medicinal plants for antifungal activity against Candida albicans. South African Journal of Botany 73(2): 256–258. Vlahov, G., 1996. Fatty acid distribution of triacylglycerols from aril and cotyledon oils of Afzelia quanzensis. Phytochemistry 42(3): 621–625. Gérard, J. & Louppe, D., 2011. Afzelia quanzensis Welw. In: Lemmens, R.H.M.J., Louppe, D. & Oteng-Amoako, A.A. (Editors). PROTA (Plant Resources of Tropical Africa / Ressources végétales de l’Afrique tropicale), Wageningen, Netherlands. Accessed 14 April 2019. This page was last modified on 23 March 2017, at 18:27.